In our line of work, we meet a lot of SketchUp ninjas. These people have gone way beyond memorizing keyboard shortcuts and customizing templates; they bend SketchUp Pro and LayOut to their will to solve complex design and process problems, to collaborate more efficiently with clients and partners, to build successful businesses. Frankly, these are the folks who make SketchUp do things that even we never imagined possible. We’re inspired by these 3D experts, and we want to help transfer their expertise and knowledge to the next generation of SketchUp professionals. Our new Visiting Professionals Program is an exciting opportunity for U.S.-based university students and faculty to learn how SketchUp Pro and LayOut are used in professional practice across a variety of disciplines. 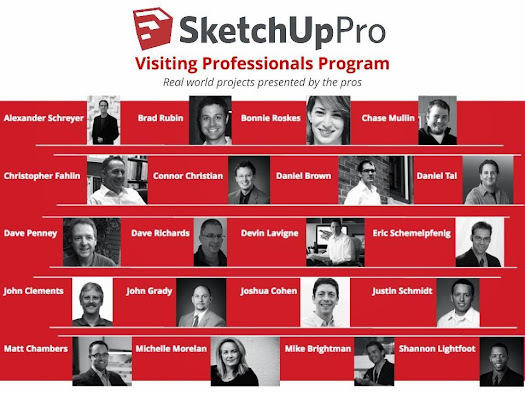 The SketchUp Pro Visiting Professionals Program provides access to real-world experts in architecture, planning, landscape architecture, interior design, construction, video game design, film and stage design -- just to name a few. Our program participants include professional designers, renowned educators, and published authors. Beyond SketchUp Pro, these are professionals who have a lot to share about managing schedules and expectations, getting client buy-in and selling project ideas, and working across multiple software platforms to develop flexible workflows. After all, for most people, getting work done means choosing the right tools and making them all work together. Visit our program site to learn more about what a visit to your school might include, and browse our directory of professional specialists. Then, apply to have a SketchUp Visiting Professional come to your institution. We will be facilitating a limited number of no-cost, U.S. visits for the 2013-14 school year. This sounds like a great program and incredibly important to get the word out that creativity in K-12 and post high school software should not be limited to Autodesk and Dassault nor to just project lead the way classes. Thanks to these talented professionals and Trimble for getting the word out.